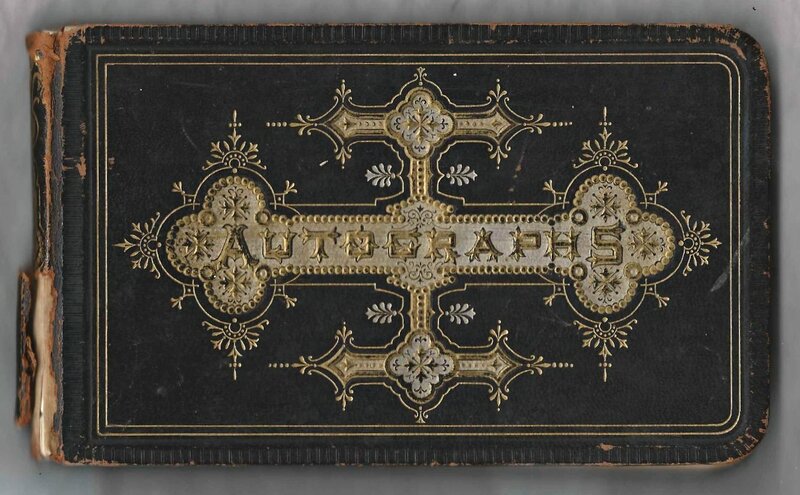 Heirlooms Reunited: 1870s/1880s Autograph Album of Sophia Bishop Kent of Rhode Island and Washington, D.C.
1870s/1880s Autograph Album of Sophia Bishop Kent of Rhode Island and Washington, D.C.
1870s and 1880s autograph album of Sophia Bishop Kent of Rhode Island, and, later, a teacher at the Daniel Webster School at Washington, D.C.
Sophia added a note in pencil to the page above to indicate that the page was designed and executed by Solon Kelley, who later signed a page in her album as S. C. Kelley, on 21 June 1878. I wouldn't have made the connection, except that Sophia wrote "Solon" in pencil. 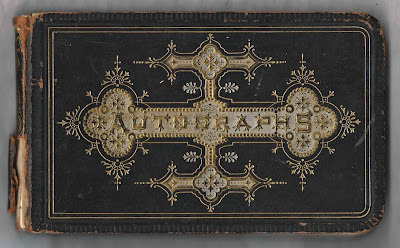 The album is approximately 7" x 4-1/4" and contains the autographs of 98 people, including Sophia herself, her classmates at Normal School, her students at the Daniel Webster School in Washington, D.C., and others. Most people used an entire page to write their sentiments, but three pages contain the signatures of multiple students at the "Webster School". An alphabetical list of the signers appears at the end of this post. 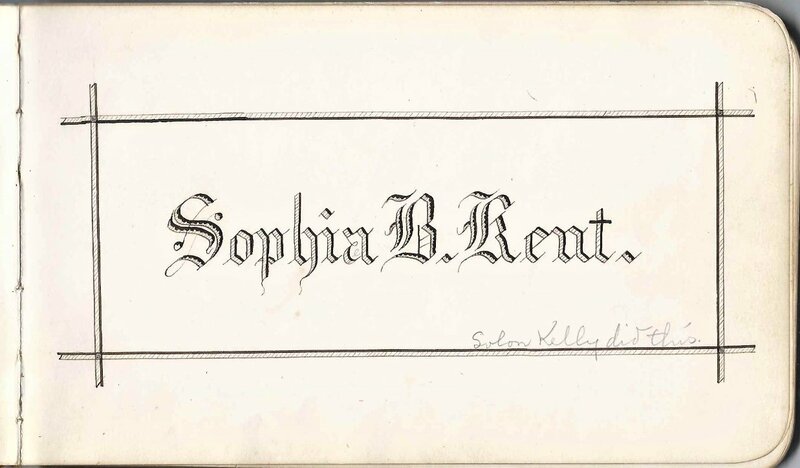 Sophia Bishop Kent, "Sophie" was born 16 January 1860 at Lippitt, Rhode Island, the daughter of John Remington Kent and Hannah Aldrich (Yeaw) Kent, who were born at Johnstown, Rhode Island, and Scituate, Rhode Island, respectively. Sophie's paternal grandparents were Samuel and Susan B. (Remington) Kent. Her maternal grandparents were George and Sophia (Bishop) Yeaw. Some of the signers in Sophie's album mentioned the Normal School. I'm not exactly sure where this was, as I found that a reference online that the Normal School at Providence was dedicated in 1879. 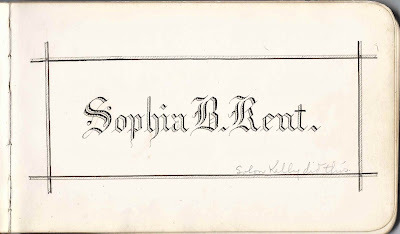 The signatures are dated 1878, and I believe the signers, including Sophia, were from the Class of 1878, so either the school started at Providence earlier than 1879, or Sophia and the others attended Normal School at a different location. Alice A. Potter of Cranston, Rhode Island, signed at page at the Normal School at Providence, also on 13 June 1878. After graduating from Normal School, Sophia started her teaching career. In the 1880 Census of Warwick, Rhode Island, she was living at home and working as a teacher. 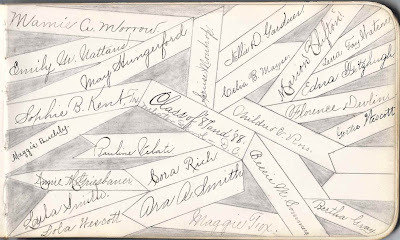 At some point after the Census enumeration, Sophia moved to Washington, D. C. Below is the image of a page signed in June 1885 by multiple students; Sophia penciled in a notation that the students were from her first class at "The Webster", which was the Daniel Webster School. I found a newspaper article [scroll down to the center bottom] from the Washington Herald issue of 15 May 1908 that indicated that Sophie received a master of laws degree from the Washington College of Law. By 1920, Sophie was working as a school principal. The last record of Sophie that I found was her name on a New York Passenger list where she was returning from a trip to Bermuda in 1932. An online tree has her death in Rhode Island in 1957, but I didn't find that record myself. If you have corrections to the information above, or additional information on Sophie or any of the signers listed below, please leave a comment or contact me directly. Thanks! 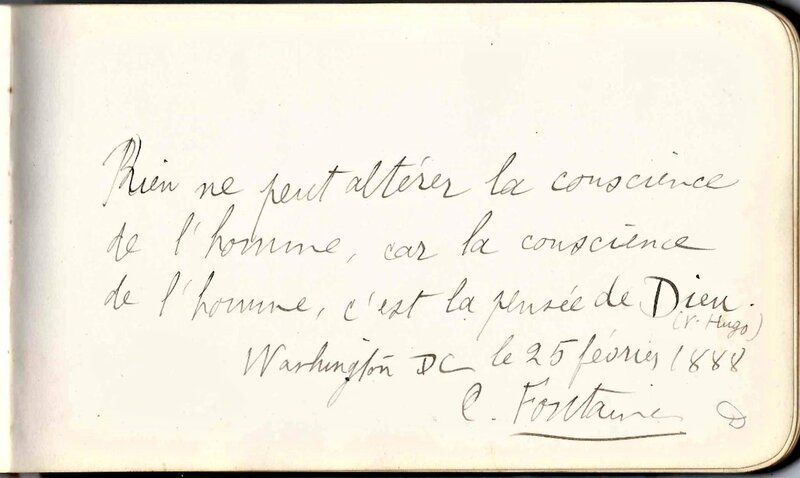 Florence Perry signed a page at Washington, D.C., on 8 June 1885 and drew a cute sketch. 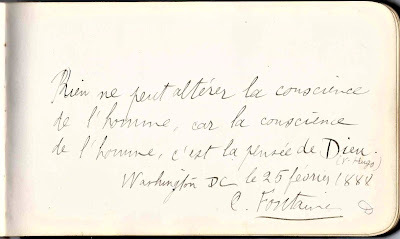 C. Fontaine signed a page at Washington, D.C., on 25 February 1888, entirely in French. 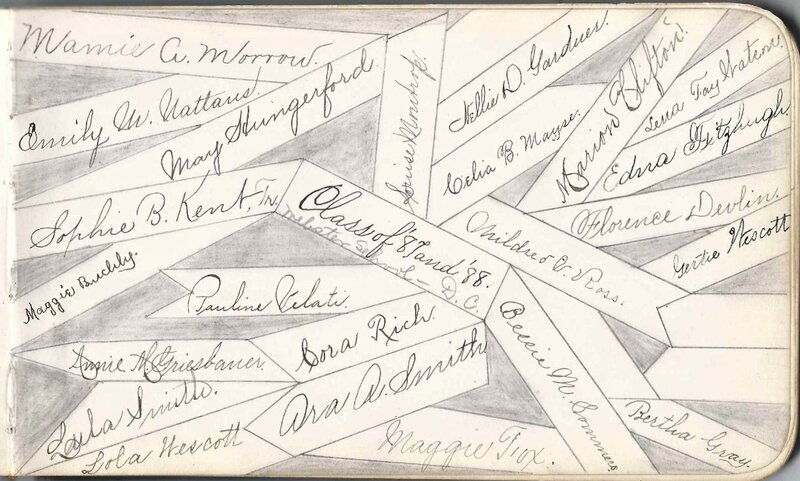 Students from the Classes of 1887 and 1889 at the Daniel Webster School in Washington, D.C., signed a group page. 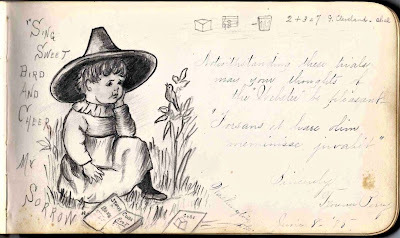 Theresa Bien, signed 16 June 1885; shared a page with multiple students, who all signed in June 1885. Sophia wrote in pencil: "My 1st Class at the Webster". Daniel Webster School at Washington, D.C.
Lottie C. Bogan, signed June 1885; shared a page with multiple students, who all signed in June 1885. Sophia wrote in pencil: "My 1st Class at the Webster". Daniel Webster School at Washington, D.C.
Juliet Burroughs; shared a page with multiple students, who all signed in June 1885. Sophia wrote in pencil: "My 1st Class at the Webster". Daniel Webster School at Washington, D.C.
Ella Cohen; shared a page with multiple people in 1889, likely students of Sophia B. Kent at The Daniel Webster School at Washington, D.C.
Bessie Cummins, signed 15 June 1885; shared a page with multiple students, who all signed in June 1885. Sophia wrote in pencil: "My 1st Class at the Webster". Daniel Webster School at Washington, D.C.
Bertha M. Dove, signed at Washington, D.C.
Mae L. Dove; shared a page with multiple people in 1889, likely students of Sophia B. Kent at The Daniel Webster School at Washington, D.C.
Lottie Dunham, signed June 1885; shared a page with multiple students, who all signed in June 1885. Sophia wrote in pencil: "My 1st Class at the Webster". Daniel Webster School at Washington, D.C. 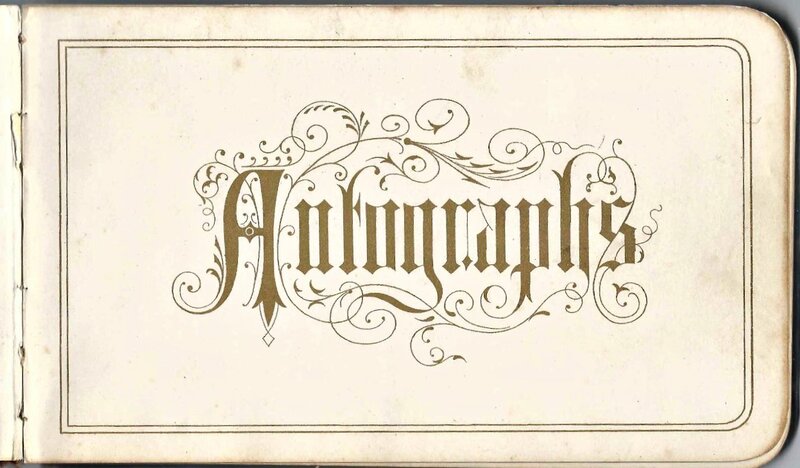 Signed with surname only, "16-1885"; shared a page with multiple students, who all signed in June 1885. Sophia wrote in pencil: "My 1st Class at the Webster". Daniel Webster School at Washington, D.C.
Mary E. Floeckher; shared a page with multiple people in 1889, likely students of Sophia B. Kent at The Daniel Webster School at Washington, D.C.
Kate Franzoni; shared a page with multiple people in 1889, likely students of Sophia B. Kent at The Daniel Webster School at Washington, D.C.
Appears to be Millie A. Ganz or Gauz; shared a page with multiple people in 1889, likely students of Sophia B. Kent at The Daniel Webster School at Washington, D.C.
Susie M. Gheen, signed in 1889; shared a page with multiple people in 1889, likely students of Sophia B. Kent at The Daniel Webster School at Washington, D.C.
Minnie Goetz, signed June 1885; shared a page with multiple students, who all signed in June 1885. Sophia wrote in pencil: "My 1st Class at the Webster". Daniel Webster School at Washington, D.C.
Nellie D. Harvell; shared a page with multiple people in 1889, likely students of Sophia B. Kent at The Daniel Webster School at Washington, D.C.
Minnie Hutchinson; shared a page with multiple people in 1889, likely students of Sophia B. Kent at The Daniel Webster School at Washington, D.C.
Ella M. Johnson; shared a page with multiple people in 1889, likely students of Sophia B. Kent at The Daniel Webster School at Washington, D.C.
Mary June - or perhaps she signed only with her first name in the month of June; shared a page with multiple students, who all signed in June 1885. Sophia wrote in pencil: "My 1st Class at the Webster". 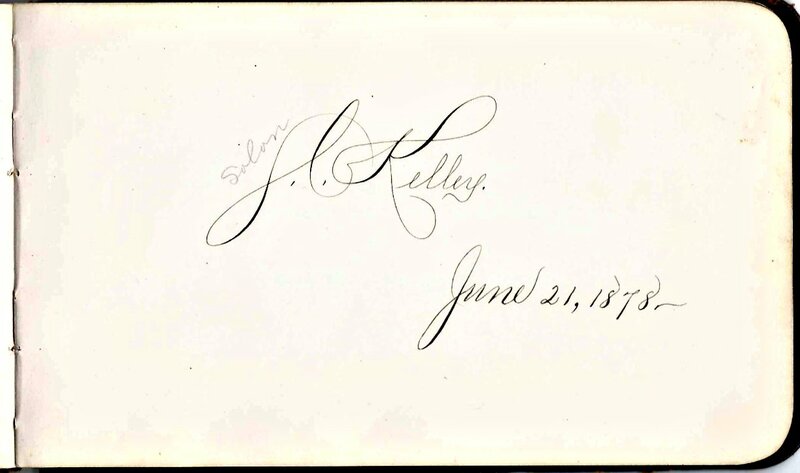 Danieil Webster School at Washington, D.C.
S. C. Kelley, signed on 21 June 1878. Written in pencil, likely by Sophia, is the name Solon for the "S". He would be the same person who made the fancy design for Sophia's inscription page. Sophia Bishop Kent of Rhode Island; album owner. 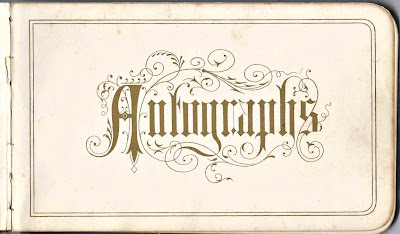 Sophie B. Kent also added her signature to a page signed by her students in the Classes of 1887 and 1888 at the Webster School at Washington, D.C.
D. H. Kincaid of Kentucky, signed on 15 April 1888, perhaps at Washington, D.C.
Annie W. Major, signed June 1885; shared a page with multiple students, who all signed in June 1885. Sophia wrote in pencil: "My 1st Class at the Webster". 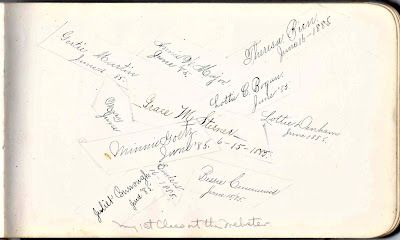 Daniel Webster School at Washington, D.C.
Gertie Martin, signed 16 June 1885; shared a page with multiple students, who all signed in June 1885. Sophia wrote in pencil: "My 1st Class at the Webster". Daniel Webster School at Washington, D.C.
Mamie A. Morrow; shared a page with multiple students from the Classes of 1887 and 1888 at The Webster School at Washington, D.C.
Edna Parsons; shared a page with multiple people in 1889, likely students of Sophia B. Kent at The Daniel Webster School at Washington, D.C.
Oliver A. Pease, Tramp, signed 3/9/1885. Written in pencil, presumably by Sophia, "Washington State"
Esther A. J. Porter of Providence, Rhode Island, "Class of '78" "F.F.F." Nettie Sauter; shared a page with multiple people in 1889, likely students of Sophia B. Kent at The Daniel Webster School at Washington, D.C.
Mattie Scheirer; shared a page with multiple people in 1889, likely students of Sophia B. Kent at The Daniel Webster School at Washington, D.C.
Imogene E. Sheldon of Cross' Mills, Rhode Island; Sophia's classmate "F.F.F." 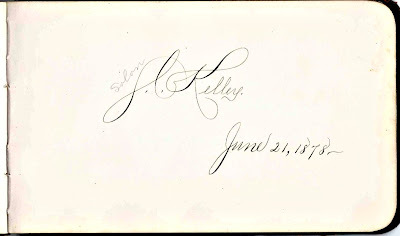 Frank Skelton; shared a page with multiple people in 1889, likely students of Sophia B. Kent at The Daniel Webster School at Washington, D.C.
Grace M. Sterner, signed 15 June 1885; shared a page with multiple students, who all signed in June 1885. Sophia wrote in pencil: "My 1st Class at the Webster". Daniel Webster School at Washington, D.C.
Edith Strattan; shared a page with multiple people in 1889, likely students of Sophia B. Kent at The Daniel Webster School at Washington, D.C.
Frankie Wheat; shared a page with multiple people in 1889, likely students of Sophia B. Kent at The Daniel Webster School at Washington, D.C.
Hattie E. Whipple of Central Falls, Rhode Island, "R. I. S. N. S., Prov. - Class of June '78 F.F.F." Rhode Island State Normal School at Providence, Rhode Island. 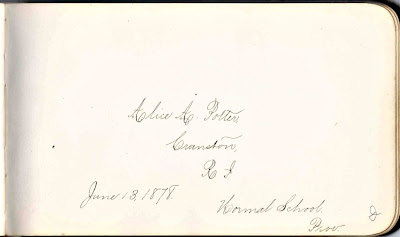 Ellie E. Whiting of Cumberland, Rhode Island, signed at Normal Hall in June of 1878, presumably at the Normal School at Providence, Rhode Island. Ludwika Wieser; shared a page with multiple people in 1889, likely students of Sophia B. Kent at The Daniel Webster School at Washington, D.C.
Anna Wilkening; shared a page with multiple people in 1889, likely students of Sophia B. Kent at The Daniel Webster School at Washington, D.C.
Lydia Wilkins; shared a page with multiple people in 1889, likely students of Sophia B. Kent at The Daniel Webster School at Washington, D.C.
Nellie E. Wilson of Washington, D.C., signed on 17 June 1885. Sophia, presumably, wrote in pencil at the bottom: "Mrs. Shir-Cliff". Nellie E. Wilson married William H. Shir-Cliff on 17 April 1890 at Washington, D.C.
Florence Withers; shared a page with multiple people in 1889, likely students of Sophia B. Kent at The Daniel Webster School at Washington, D.C.
Lottie E. Wright; shared a page with multiple people in 1889, likely students of Sophia B. Kent at The Daniel Webster School at Washington, D.C.
Bessie Young; shared a page with multiple people in 1889, likely students of Sophia B. Kent at The Daniel Webster School at Washington, D.C.